Clear all jellies and reach 60000 points to complete the level. You have only 30 moves. 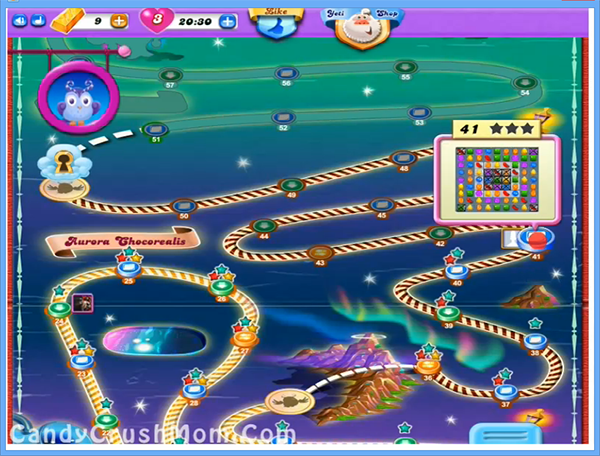 This is one of hard level with same board as in normal candy crush saga with four grills on corner and few are in center with jellies. Its not that easy to complete this level and first you need to break grill boxes or try to increase moon power by breaking jellies that the Odus owl have with balancing and as moon will struck will break grill boxes plus give more chance to make colorbomb, striped candy or any other special candy. You should try to combine special candies to each other like colorbomb with striped candy to break all jellies fast. We completed this level with 249080 score by creating more colorbombs and other special candies and at the end remaining moves converted to fish booster that help to make three star score.